How was your week? I was pretty bored, so I decided to finally read something, I decided it to be 'Looking for Alaska' by John Green, and I just couldn't stop reading it until I finished it all, so if anyone wants to talk about it, contact me on Stardoll. Anyway, an average week on Stardoll, and you know what goes next, right? No, I did not mean new Tribute store, before that, here goes my weekly recap. On Monday, we got new collection in Windows on the World, Ramadan themed. I admit I love the collection. I love seeing outfits of different cultures and religions. We got long gowns, hijabs - clothes worn mostly by people of Islamic religion, and the collection is inspired by the biggest and most important month of the religion. (Please correct me if I am wrong, I don't know much about Islam, as it is not my religion.) Anyway, even it is nice Stardoll thought of giving users something related to their culture and religion, I think other countries deserve to get recognition for their holidays as well - a small collection of few outfits at least. On Tuesday, Stardoll announced a new contest, never seen before. Unlike Stardoll's next top artist, where users were encouraged to make different kinds of accessories and clothes using Hair Star Design studio, here you need to create only a wig. Stardoll's next Top Hair Stylist is a contest where members get to create a wig using the same studio as mentioned, but this time, Stardoll will only consider hairstyles. Winning entries will get their hairstyles released in Tress Up store in August, get their winning entries for free, and top 5 stylists will receive stardollars. Seeing there are too many extremely talented hair designers on Stardoll, I think it may be tough for Stardoll to choose the best ones. I am really looking forward to the collection and seeing all of the amazing designs. 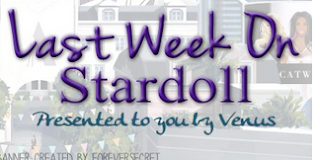 On Wednesday, Stardoll released 2 new floors of Nelly.com perfumes. The perfume bottles look pretty amazing, and we even got a cute make up bag. While they look really good and could be of great use in some suite rooms, other than aesthetic role, there isn't much use for them. Just put them on your night table, make up table, bathroom shelf, etc. Yeah, another Summer collection. You gotta love the background! (Note to Stardoll: please give us more 'ordinary' rooms!) Clothes are, well, typical for Summer, the color, fabrics, patterns. Kinda like last week's Riviera collection, minus the swimsuits, but rather long and some short dresses perfect for warm summer day and/or walk by the beach. I really wish though Stardoll allowed us to design our own pals so we can walk by the beach with a friend or two. I know I would make mine tall, blond, short haired male with a bit too many tattoos first. Anyway, that's it for a week, tomorrow a Tribute season on Stardoll officially begins, with John Galliano collection to 'open the season'. I already see several items that are must buy, because I just love formal gowns a bit too much. So vote, comment, and see you next week (or sooner).